Man of the moment Maverick Viñales led Warm Up ahead of Andrea Dovizioso and Marc Marquez, is a Suzuki win on the cards? Yellow smoke filled the Mugello circuit as MotoGP™ Warm Up began, Valentino Rossi (Movistar Yamaha MotoGP) a clear fan-favourite. But it was Maverick Viñales (Team Suzuki Ecstar) who topped morning Warm Up with a 1’47.295. Suzuki last won in Mugello in 1995 when Daryl Beattie won the 500cc race. Behind the young Spaniard was Andrea Dovizioso (Ducati Team) who has resolved the neck issues which plagued him during the start of the week. He’s yet to test his neck over race distance and is looking to recover from 13th on the grid. 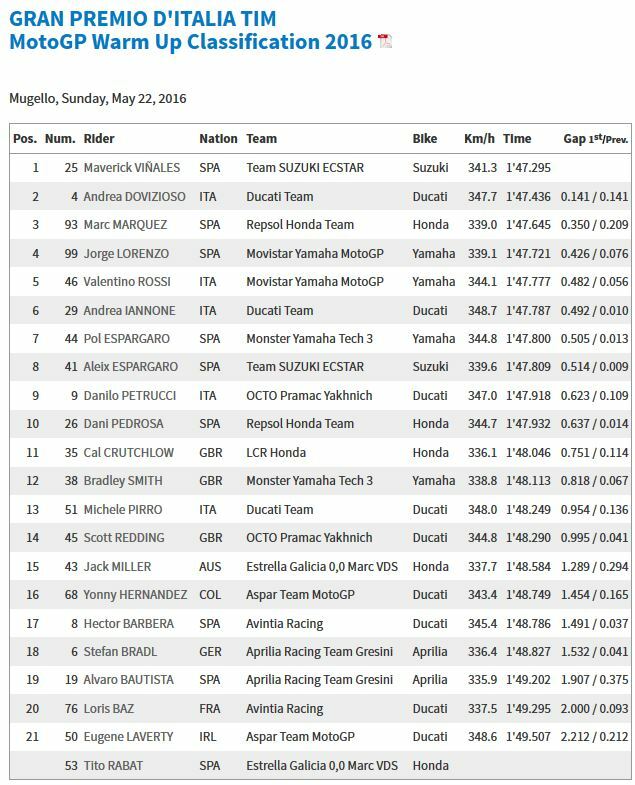 Marc Marquez (Repsol Honda Team) completed the top three, the RC213V going better in the cool morning conditions. 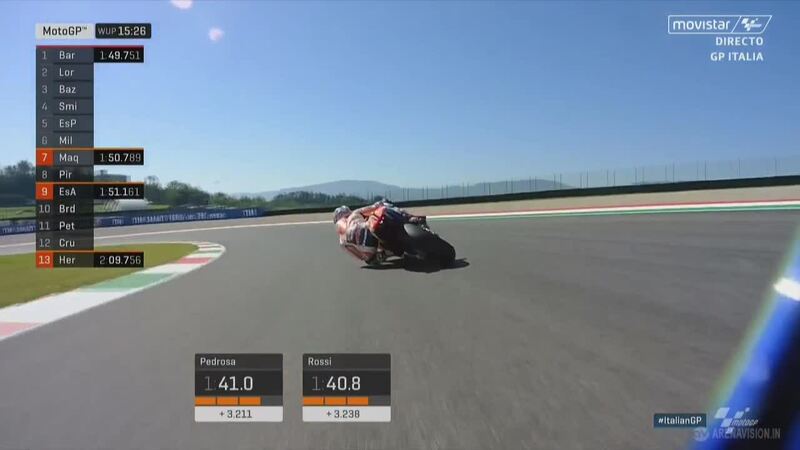 The hotter conditions of Qualifying on Saturday, similar to the ones the race will be held in, saw Marquez struggle with his Honda slightly. 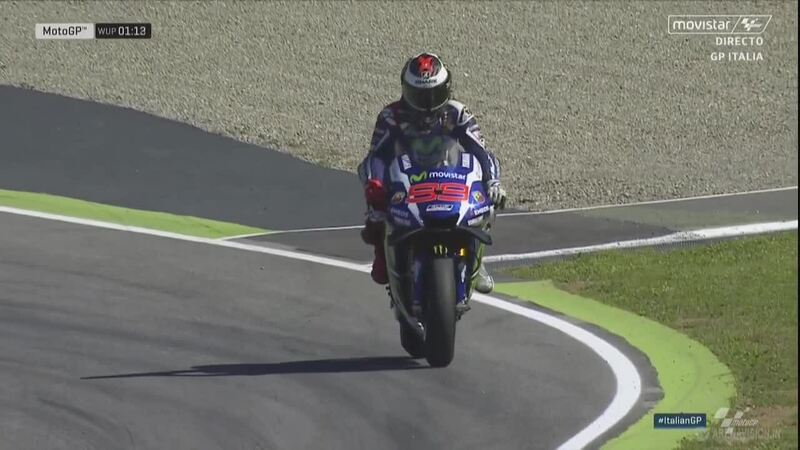 It proved a dramatic session for Jorge Lorenzo (Movistar Yamaha MotoGP) who had a major engine issue down the straight, forcing him to pull off. The factory Yamaha rider still managed the fourth fastest time. Pole man Rossi ended the 20 minute practice session in fifth, 0.482s behind Viñales who starts alongside him on the front row. He, Viñales and Iannone have all shown strong race pace in the build up to the race. 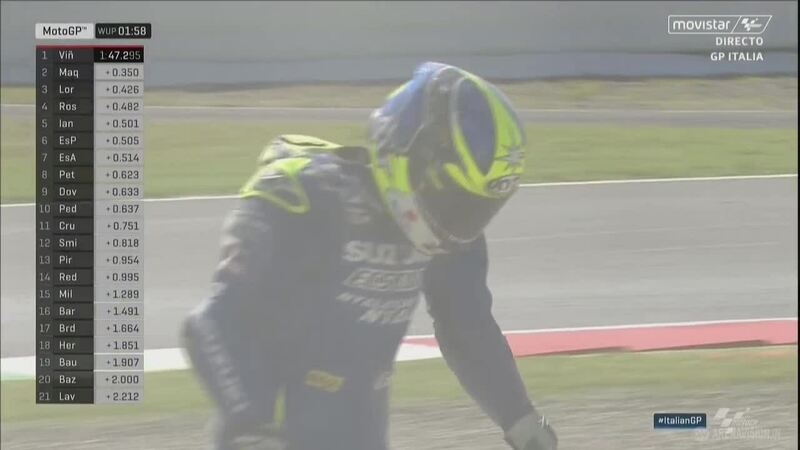 Aleix Espargaro (Team Suzuki Ecstar) had a fast fall at Turn 13, walking away. Alvaro Bautista (Aprilia Racing Team Gresini) suffered a hard fall at Turn 8, his RS-GP cartwheeling through the gravel.